During this time of the year, most companies start thinking about their strategic planning process and what they need to do around this subject. Strategy is about understanding what has happened this past year and what needs to be achieved during the following year. In effect, it is a determination on what has worked well, and what should be improved upon. In the past, a lot of the strategy was around a five-year business plan or at the very least it is a multi-year approach. But with the current level of disruption and change, I think five-year strategic plans just doesn’t exist anymore. Or even if it does, it’s likely meaningless or of little value. When I speak to CEO’s and Directors of companies about strategy, I hear this over and over again. It is not so much about strategy, it is the ability of the team to execute the strategy that is making or breaking a successful year. Often there’s a complete inability to get the company to move to full execution of the strategy. We know it’s easy to sit in a room and talk strategy and determine priorities. But it’s another challenge entirely to execute strategy effectively. 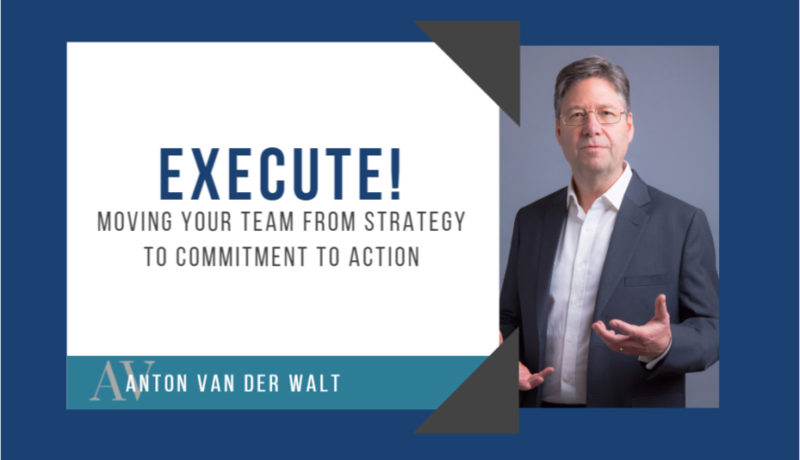 From what I hear and see, the biggest failure in executing strategy is the inability to get employees fully committed – committed to the strategy and committed to actioning the strategy. It is the commitment to do what you said you were going to do, and to action it. I’m going to run a series of webinars discussing those steps that needs to be taken, to go from strategy to commitment to action. We will discuss what those steps are, how to go about determining the right priorities, how to determine what the right metrics are, and how to implement a strong governance process to support the execution process. The webinars will be short and impactful, and participants will walk away with a better understanding on how to execute strategy, and how to make sure teams remain accountable and committed to the execution process. The link to the webinar “Execute! – how to move your team from strategy to commitment to action” is below. Registration provides you with the option to choose a date and time that suits you. This is a series of webinars and whilst the “Execution!” theme of each webinar will remain the same, each webinar will be unique, each with its own ideas and practical solutions. Should there be an opportunity for you to attend on multiple dates, this would be of value to you.